March Lawson was just shy of her seventeenth birthday when her life took a radical turn. With her parents dead of influenza, instead of preparing for her debut in society, March found herself responsible for her younger sisters, Julia, ten, and Faith, eleven, and for her one-year-old brother, Bennett, the new viscount. Knowing that her father has left substantial trusts for all his children, March never imagines that finances will be a problem. But when the men left in charge of the trusts ignore her letters asking for help, March is pressed to meet the basic needs of her small family. Eight years later, Faith and Julia having reached the age to make their debuts and the lordly young viscount in need of male influence and tutoring, March is desperate. She resorts to forgery in order to access her own funds to care for her home and family. When the marquess in charge of the Lawson funds summons her to London, March is certain that her sins have found her out. Michael Cavensham, Marquess of McCalpin, has his own problems. He feels woefully incompetent to deal with all the matters that fall to him as the heir of the Duke of Langham. Only the expertise of his large staff and the assistance and loyalty of his younger brother allow him to do so and protect the secret he has guarded for most of his life. When his bookkeeper informs him of the suspicious withdrawals from the Lawson trust and the marquess acknowledges that his signature has been forged, he realizes how little he knows about the Lawsons and decides to investigate, beginning with a summons to March. March doesn’t expect to be rendered breathless by the handsome marquess. Michael does not expect to be charmed by the lovely March. Neither does he expect to find the conditions he uncovers at the Lawson estate. Despite the attraction that sparks, these two are not predisposed to trust one another. Michael believes that March is dishonest, and she believes him indifferent to his responsibilities. But as their knowledge of each other grows, their relationship changes. Just as it seems unexpected happiness lies in the future of all concerned, multiple plots threaten the couple. Michael is given evidence that causes him to doubt March and always there is the fear that his dreadful secret will be exposed. 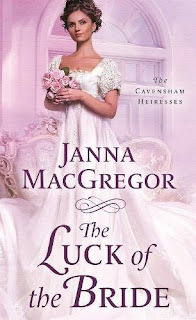 The Luck of the Bride is the third book in MacGregor’s Cavensham Heiresses series. The protagonists are both interesting characters who are refreshingly different from the usual hero and heroine. Young as she is, March shows admirable strength in functioning as the head of her household and providing the love her young siblings need. Michael is likable and sympathetic, and his problem is one that I don’t recall encountering in historical romance before, although I have some experience with it in real life. The secondary characters are mostly appealing, especially March’s siblings and Michael’s parents. Fans of the earlier books in the series will be pleased to see Michael’s cousin Claire and her husband, the Marquess of Pembrook (The Bad Luck Bride) and his sister Emma (also a good friend to March) and her husband, the Earl of Somerton (The Bride Who Got Lucky) play minor roles. There is much to like in this book, and I did enjoy it. However, Michael’s lack of trust in March disturbed me, and her quick forgiveness of his doubts bothered me even more. I’m not a vengeful reader who demands her pound of grovel from every erring hero, but I needed more here. Even a sweet HEA did not make up for the lack. My disappointment was not enough to spoil the book for me, but it did prevent my classifying it as a keeper. Regardless, I remain eager to see what MacGregor does in the fourth book, The Good, the Bad, and the Duke, scheduled for release in early December. I do recommend the series, and if you like a credibly strong heroine and endearing secondary characters and have a higher tolerance than I for distrustful heroes, The Luck of the Bride may prove to be your favorite. I've been hearing a lot about this one. Thanks, Janga! I've enjoyed this series and am very excited for the fourth book. Redeemed bad boys are always a draw for me. PJ, I think had I liked Michael less, I would have been less bothered by his failure. But I think my level of engagement with the character says positive things about MacGregor's characterization skills. If you read it, Di, let us know what you think. Different responses keep book discussions interesting IMO. I'll let you know Janga, if I do get to read it and what I thought about it. I enjoyed this book a lot. I read it as a galley, so I don't know how much it may have changed before it went to print. Your thoughts were mine exactly. I wanted him to at least listen to her. But, I also did not like that there was not an explanation of why no one was monitoring the income for the family. I have loved this series, and I look forward to the next book, this was simply not my favorite. I've read things about this book already. Looking forward to reading this book. Thanks for your review PJ. It's nice to read a historical with a strong heroine. I too am looking forward to the next book in the series. Thank you for the review. I am not familiar with this series and don't believe I have read any of MacGregor's books. It does sound like an enjoyable read. Chapter One eighty years later instead of eight. guessed the villain right away. did not finish.